Which mammals lay eggs and suckle their young? 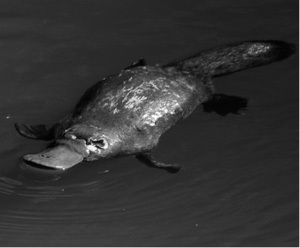 The duck-billed platypus (Ornithorhynchus anatinus), the short-nosed echidna or spiny anteater (Tachyglossus aculeatus), and the long-nosed echidna (Zaglossus bruijni)—indigenous to Australia, Tasmania, and New Guinea, respectively—are the only three species of mammals that lay eggs (a non-mammalian feature) but suckle their young (a mammalian feature). These mammals (order Monotremata) resemble reptiles in that they lay rubbery shell-covered eggs that are incubated and hatched outside the mother’s body. In addition, they resemble reptiles in their digestive, reproductive, and excretory systems and in a number of anatomical details (eye structure, presence of certain skull bones, pectoral [shoulder] girdle, and rib and vertebral structures). They are, however, classed as mammals because they have fur and a four-chambered heart, nurse their young from gland milk, are warm-blooded, and have some mammalian skeletal features. The remarkable platypus, which looks like a combination between a duck and a beaver, is one of only three mammal species that lays eggs.